Pune is an incredible city that has evolved over the years. From reputed schools and colleges to renowned MNC’s from around the globe, Pune is a place that many want to shift to. The city’s plush greens and low air pollution is another reason why Pune is one of the most loved cities in the country today. There are several locations in Pune that individuals are shifting to and Hinjewadi is one of them. Hinjewadi is a suburb in Pune that is known for its popular IT parks like Rajiv Gandhi Infotech Park, plenty of companies, social infrastructure and easy connectivity to other locations in Pune. This suburb has a lot to offer individuals of all age groups as it goes through constant development each day. With a rise in property demand, the options of property in Hinjewadi, Pune are high today! 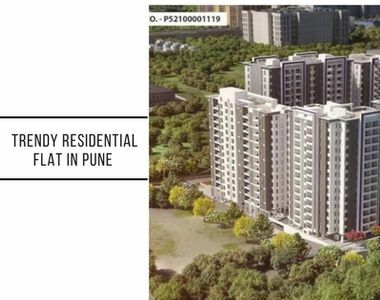 Itrend Homes is a distinct residential projects in Hinjewadi, Pune by Saheel Properties that offers divine luxury and comfort for a sophisticated lifestyle. This development sits on a bed of 6.5 acres and consists of 6 towers (P +17) that offer plush variants of 1.5BHK and 2BHK convertible apartments that are chic and futuristic. The apartment carpet areas start at 500 sq. ft. and go up to 648 sq. ft. Without a doubt, the Itrend Homes Floor Plan will cater to all your needs and requirements. This residential development is packed with world-class internal and external amenities for a modern-day lifestyle that is simply out of this world! You will find apartments that contain premium fittings & fixtures, vitrified flooring, wooden finish vitrified flooring in bedrooms, molded internal doors and aluminum sliding windows, fancy kitchens with granite tops, dado tiles and multiple provisions, premium paint on internal walls, video door phone, multiple safety features and more. The external amenities at this residential development include a clubhouse, hi-tech gym, meditation centre, multiple sports facilities and a play-zone for kids, daycare centre, temperature controlled swimming pool, multipurpose LED court, guest rooms, landscape garden, wide open greens, studio space for music, dance and pottery, car parking facility, café and high-end security with video surveillance in common areas. Starting at a price of Rs.38.80 lakhs and going up to Rs. 48.79 lakhs, the convertible residential spaces at this development are affordable and simply impressive. Without a doubt, this is an ideal development for home buyers and investors as well! Choose from a number of payment plans along with home loan facilities through reputed banks, NRI services, customer services and more.